Emergencies Don’t Wait. Neither Should You. 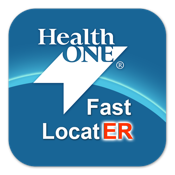 The HealthONE Fast LocatER provides a convenient way to find the nearest HealthONE Emergency Rooms and their wait times, find doctors based on specialty, and request an appointment from your mobile device. In case of an emergency, you can quickly connect to 9-1-1. When an illness or injury requires immediate medical attention, the last thing you want is to have a long wait. You want faster access to quality care. That is why HealthONE’s system of hospitals strives to see every patient as quickly as possible, patients with life-threatening symptoms receive top priority. And now with our mobile and web tools, we also offer more ways for patients to quickly find, connect, and request an appointment online with a top doctor for their or a family member’s healthcare needs, whether on the go, at home or in the office. Note: If you or a loved one is experiencing a life- or limb-threatening emergency, you should call 911.